Hello hello friends! Today I want to tell you about A Soft Place To Fall. 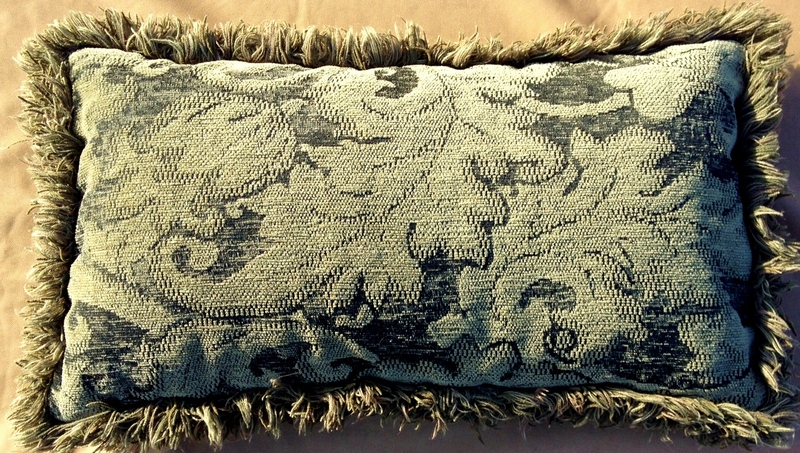 The sumptuous and textured beauty of a pillow in the picture above. I’ve owned this particular pillow for about 12 years–long enough to completely take it for granted and rarely even notice it anymore. This pillow resides on my bed as a decorative pillow perched atop all the other pillows–the real pillows–the utility pillows. But this pillow has a history that makes it special to me. Several times during a year I frequent holiday fairs, art fairs, and craft fairs. I am an equal opportunity fair attendee and it doesn’t matter to me if it’s large or small, inexpensive or quite pricey–all fairs deserve my attention! So about 12 years ago I attended a quite large fair at a large venue. I would estimate 200+ vendors. Most had big, professional booths and displays. I was feeling like I was seeing the same and very similar items from aisle to aisle among the many sellers–homemade soaps, lotions, and candles; handcrafted woodwork knick-knack shelves; dried flower arrangements. If you frequent fairs you probably know of what I speak. As my eyes were beginning to glaze over and I was preparing to leave the fair, I happened across a very small booth tucked in between two very large ones. This booth had two tables pushed together with a tablecloth. A small handmade sign was propped on the table and two mature ladies were seated off to one side. Their wares consisted of maybe two dozen decorative pillows of standard sizes and shapes and of simple solid fabrics. As I was about to pass by the booth one of the ladies made eye contact with me and said hello. Somehow I felt like it would be impolite to just breeze on by without a word. I began looking at the pillows and feeling the fabric of a few–squeezing a few. I really did not need or want a pillow. Soon these sweet ladies began to offer information about the various pillows–“oh that one has down filling” “this one is the first one I put fringe on” “I just love that color–that’s why I made it”. They were so warm and genuine and enthusiastic about their pillows! I asked where they were from and they named a very small town in Iowa that I did not recognize. What I did recognize in these women were their smiles, their friendly spirits, and their creativity. I picked out my green pillow and paid for it. They were positively thrilled and giggling. I was their first sale of the weekend. These two ladies have stuck in my memory for all these years even though I don’t remember their names or the name of their small town. Their art–that soft soft pillow–has decorated my bed and comforted me for all these years. Bless you sweet ladies. There you are, with your heArt out I think this post speaks more of you than it does of those two dear ladies….. such a wonderfully kind and sweet thing to do! I bet they never forgot you either – their first sale! I love you being an equal opportunity fair attendee – no discrimination here 🙂 I feel the same way. Hello Pauline and thank you VERY much for your sweet comment! Hope your summer is going beautifully and that your garden patio is seeing plenty of relaxing! Great looking pillow! Your story is touching! So Nice!